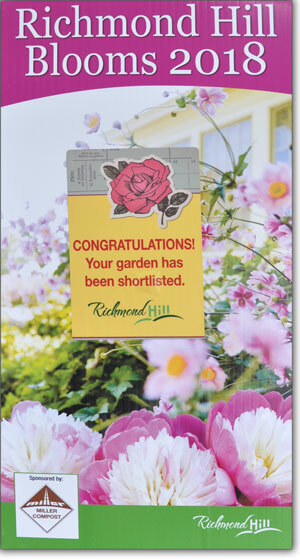 The Town of Richmond Hill is again sponsoring a gala celebration to honour the residents responsible for the top three gardens in each of the town's six wards, as nominated by the public, and judged by members of the Richmond Hill Garden and Horticultural Society. All members of the Richmond Hill Garden and Horticultural Society are encouraged to attend, and the public is also welcome. Attendance is free, but a seating reservation must be made in advance of the event by calling the Richmond Hill Centre for the Performing Arts box office at 905/787-8811 or contacting them online at www.rhcentre.ca. Seating is limited and reservations are available on a first-come, first-served basis. The evening will include a reception with light refreshments, an awards ceremony, and a special presentation titled, "If Plants Could Talk" featuring David Van de Ven of Caledon Hills Perennials, Dan Short of Sheridan Nurseries, and Mandy Vandenberg of Richmond Hill Urban Forestry.